Nail-biting is something I’ve struggled with for a number of years. It can be so disheartening, as you could be making a huge effort and doing really well and then all of a sudden, all your hard work can seemingly be undone within 5 minutes of stress. Personally, I’ve been biting the skin on my hands for as long as I can remember, which then progressed to nail-biting when I was 14 or 15. It may seem like a small issue, but it really does have the power to make you feel miserable and embarrassed about the way you look. When my nails were at their worst I did everything I could to hide my hands from view. Above anything else, let’s not forget that bitten nails are SO painful – they tend to come with a constant heavy aching feeling, and sting when you touch, well, pretty much anything. This is a habit anyone would want to leave behind, but I think the fact people continue to put up with the nasty effects of nail-biting just proves how difficult it is. Over the past 10 months or so, I have made real progress is letting this vice go. Don’t get me wrong, my nails still don’t look perfect and I’ve had many a setback, but here is how I finally managed to make real strides in leaving my nail biting ways behind. Plan a treat. Planning to get a manicure or even just to buy yourself a new nail polish when you haven’t bitten your nails for say, 30 days, can be a great incentive to keep going. It can be really helpful to have an image in mind of what you’re aiming for, especially when you’re in the early stages, during which it can feel like nothing is happening. Use cuticle oil and moisturiser. This has been my number one most helpful habit in overcoming nail-biting. I personally use Cutex Intense Recovery (£8.99, Boots) and Palmers Coconut Oil hand cream (£2.59, Boots) twice a day – both of which I would highly recommend. The Cutex treatment has worked wonders, and my nails grow faster now than they ever have before. On a side note, I would always recommend a cuticle oil or oil-based nail treatment over a ‘hardener’ that you paint onto your nails like nail-polish. 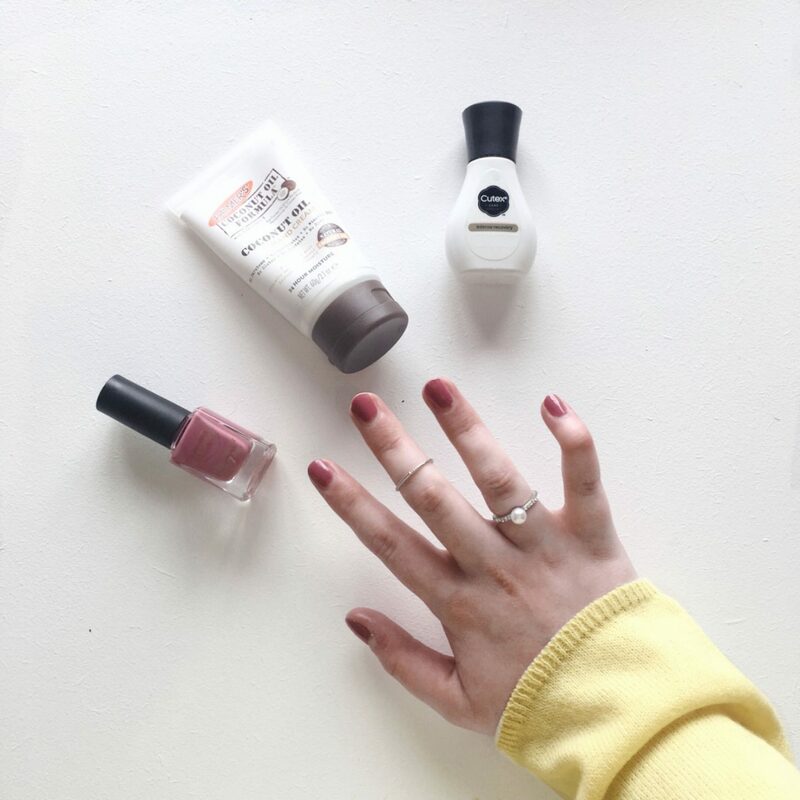 Hardeners are generally more of a short-term fix, and can lead to breakage in the long run, however oil-based treatments generally treat the problem at the root and although initial results may take longer to notice, they are in my opinion the best long-term option for nail health. Address underlying issues. I can’t stress how important this is. Nail-biting is often caused by some sort of anxiety or underlying issue, and to stop the habit, you need to address the reasons why you’re doing it in the first place. Don’t be disheartened by setbacks. I’m really trying to follow this advice myself at the moment! It’s important to remember that the process of quitting nail-biting can be a long and frustrating one, and unfortunately one where all your hard work can be undone in minutes. The most important thing is that you’re always working on it and being gentle with yourself, despite any setbacks you will inevitably have. As long as they don’t make you give up altogether, you’re still winning! Here are my nail results so far. I have a few that are still not doing good and have been biting my skin recently, but the overall picture is improving. On an unrelated note, don’t crack you fingers kids or they’ll end up looking like my little finger!